Learn How to Make a Wooden Bow! Learn how to make a long bow with guest instructor, Peter Yencken. Building and shooting wooden longbows has been practiced for thousands of years all over the world. Bows have been used in many ways, for survival (both food gathering and protection), sport, and meditation or spiritual practice (zen archery). This class is a continuation of these ancient practices. 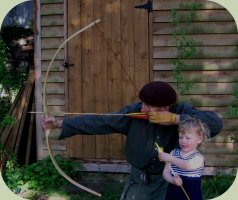 During this class you will learn the skills to build a longbow, how to choose the wood, the tools needed and their use, how to make strings, and the way to finish the wood. Shooting the bow will also be covered. By Sunday your bow will be ready to shoot. You will be taught the instinctive shooting method (this is the same method used by people who relied on the bow in their daily lives). You will leave the class with a bow, one arrow, and with enough understanding to be able to build another bow on your own. You will also take with you ideas of different possibilities for how you might use your bow. For answers to logistical questions, such as accommodations, travel and what to bring, visit our Frequently Asked Questions. Instructor: Peter Yencken has been making bows for over 20 years. He started making bows while working for Tom Brown's Tracking & Wilderness Survival School. He is a guest teacher at many wilderness schools around the country. He has taught the art of making bows to well over 500 people of all ages. Peter is a native of Australia and is a talented woodworker. At Alderleaf, Peter offers his expertise at our Wooden Bow Making Course each summer. "Peter was great! He is very modest though his knowledge and expertise really come through the more you talk to him. I enjoyed his teaching approach." "Peter, the instructor, was amazing!" "Though the woodworking skills learned are truly beneficial, I found that the most profound and beneficial skill taught was mindfulness and awareness." "Great class for beginners and the more experienced." 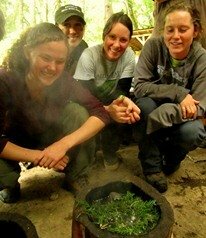 "Its was a really great hands on learning experience and a lot of fun too!"